A few weeks after Mission Cantina opened, my friend Mimi and I headed over to try out Danny Bowien’s take on another cuisine that had been in many ways changed through its Americanization – Mexican food. At that point, and as of this blog post, Mission Chinese Food is still closed (except for the erstwhile pop-up appearance), so Mission Cantina is the closest place to experience Chef Bowien’s food. 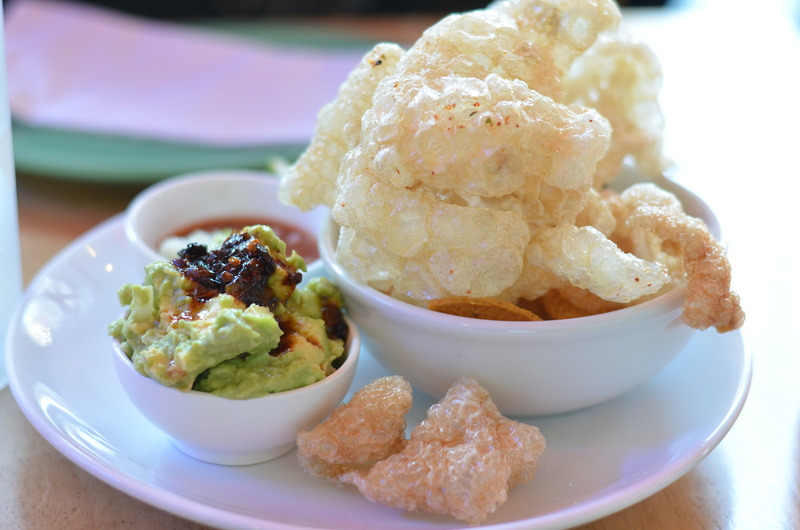 First dish, shrimp chips, chicharrones, and guac. Fresh chicharrones. My inner fatty could not be happier. 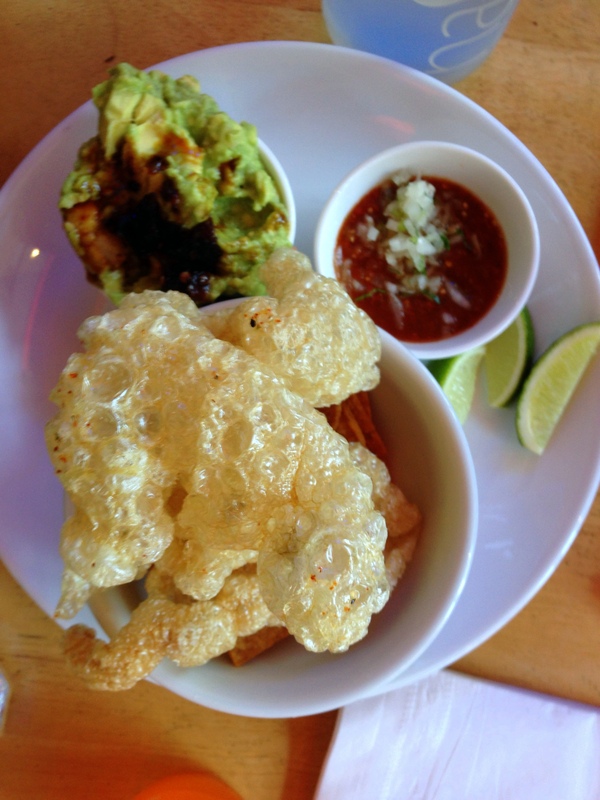 I’m not a huge fan of the thick Mexican tortilla chips, the crunch is a little too sturdy for me, which is why the chicharrones, dusted with seasoning, were a fantastic change-up. I’ve also eaten a good amount of pork rinds in my life, so I’m already that sort of degenerate. I didn’t need a push to go for something like this. 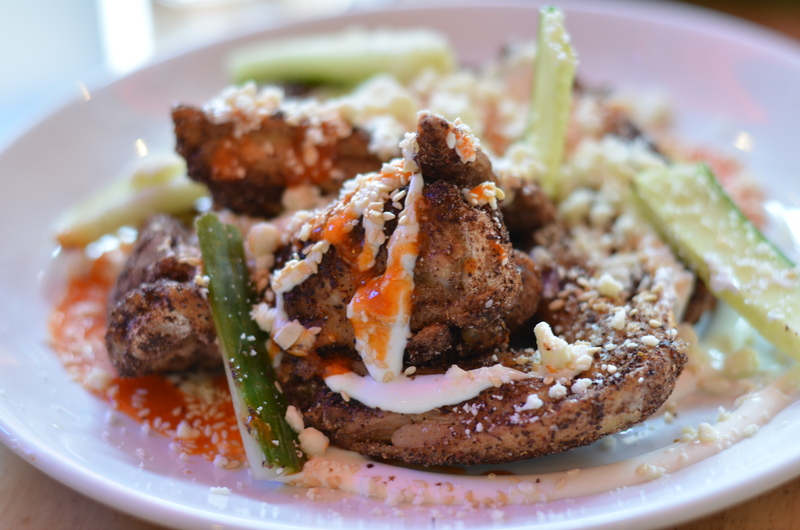 We also got an order of chicken wings, with mole spices, chili vinegar, sesame, and crema. The cucumber strips didn’t really add much but the wings were great, the skin still crisp under that sauce, the mole spices a flavorful, slow-building heat. 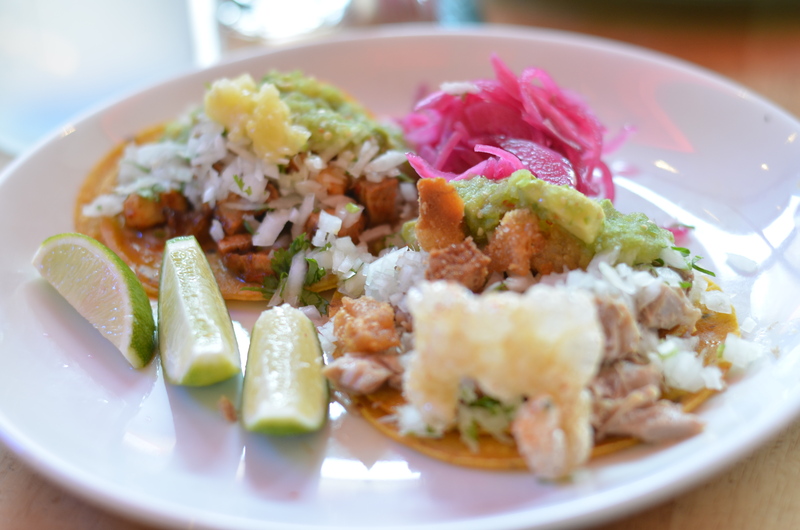 We split a pair of tacos, one al pastor (on the left) and one carnitas (right). 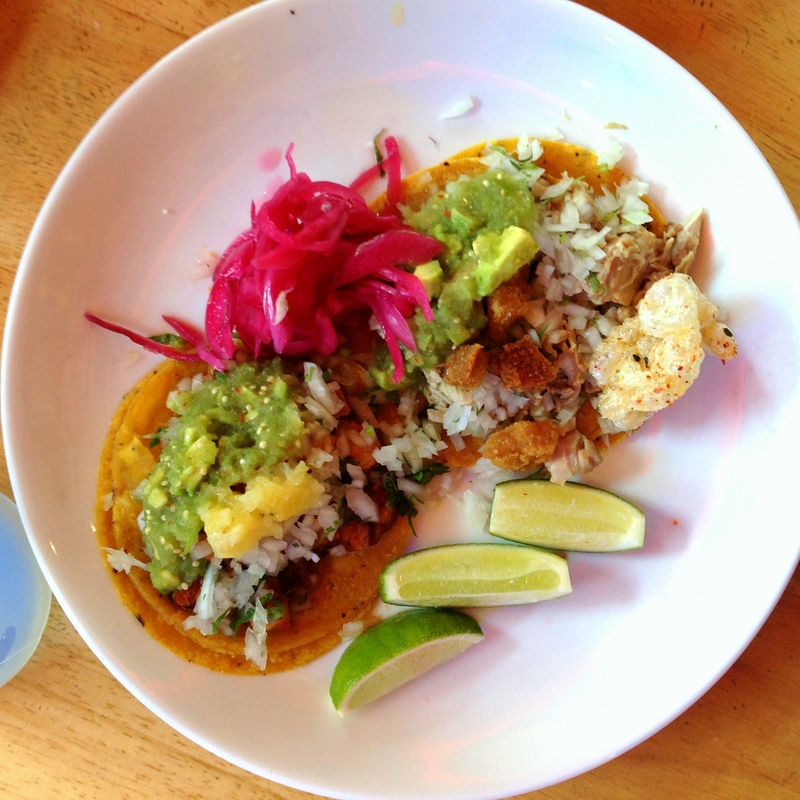 Frankly, these didn’t bowl me over, although the al pastor was well-seasoned and the pickled pineapple a nice touch. We sat by the assembly line that was churning out fresh corn tortillas, and they tasted pretty solid. But there’s something about food truck charm that I miss about tacos, and these just didn’t have it. 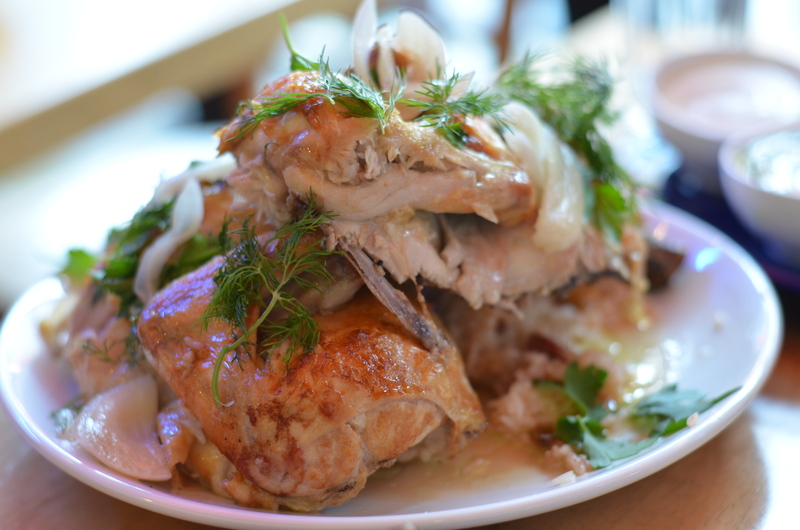 But this rotisserie chicken made us forget about the tacos. 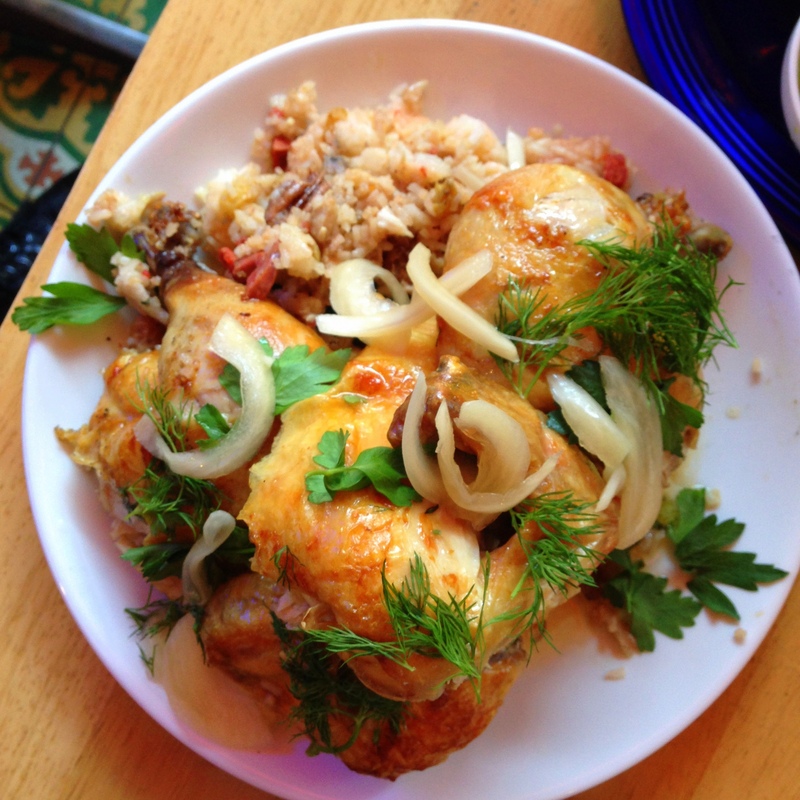 This sat on a pile of rice, deeply infused with chicken flavor and fragrant chunks of onion. The skin wasn’t particularly noteworthy, but the meat was one tender bite after another, which you can pile onto a fresh tortilla with some salsa. And the portions were exceedingly generous – this plate was probably enough for three people, maybe four.